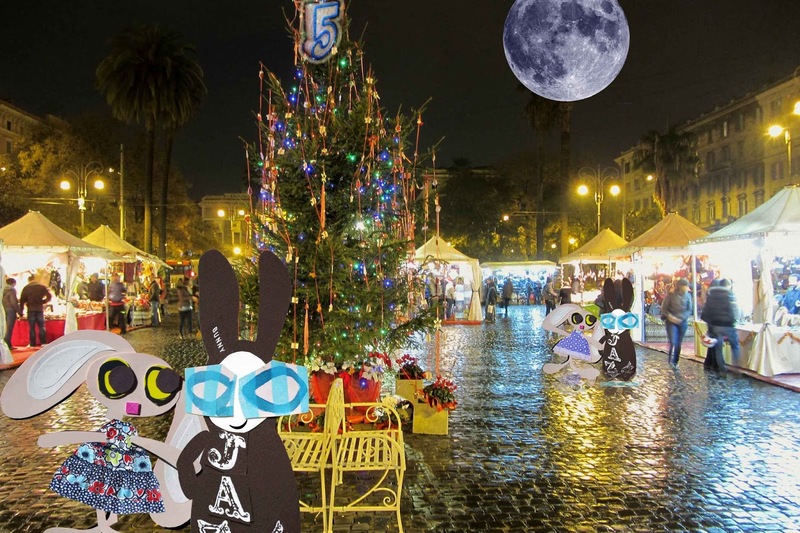 Confident that the Wabsworths had set preparations in full vigour, the Wabbit and Lapinette hopped through the Christmas market. To ensure no suspicions were aroused, their opposites followed at a discreet distance. "No word of the Fifth Force?" asked Lapinette. 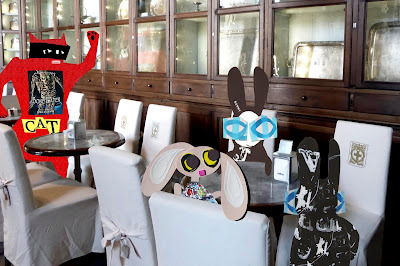 The Wabbit smiled. "A bunch of Fives were spotted near Piazza Navona, but they were only drunken soccer hooligans." "What about the Agents of Rabit?" said Lapinette. 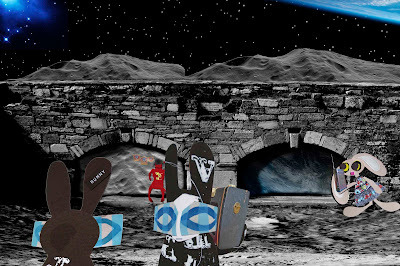 The Wabbit vaguely shook his head. "Not a dicky bird." Lapinette grinned. "Who's Dicky Bird?" It was the Wabbit's turn to laugh. "That's my nickname for our agent, Major Spitlove." They strolled rather than hopped and lingered at the market stalls, looking at trinkets and trying on hats. 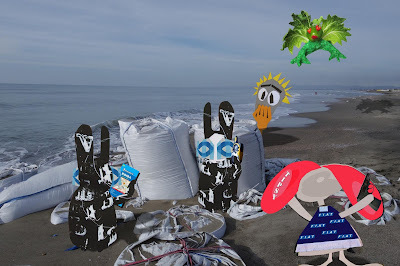 "I've seen better stuff," said the Wabbit, "Same every year," said Lapinette. "You say that every year," smiled the Wabbit. Lapinette's ears suddenly twitched and swivelled. "Did you hear a five?" The Wabbit was about to say that was synesthesia, but thought better of it when he felt a five staring at his back. He turned but saw nothing. "I really don't know what I'm looking for. What does the Fifth Force look like?" 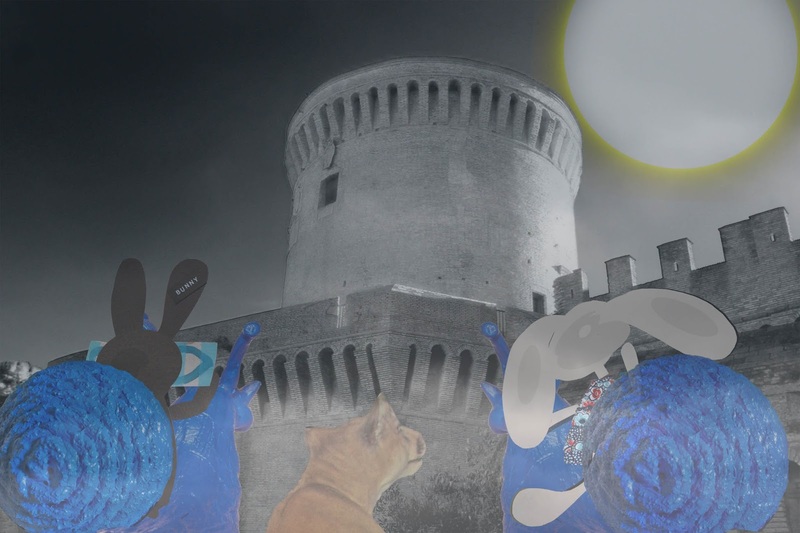 Lapinette had attended a weekend school on categorical quantum mechanics in Trieste. "If we could see it, it might look like a bunch of dark photons," she nodded. 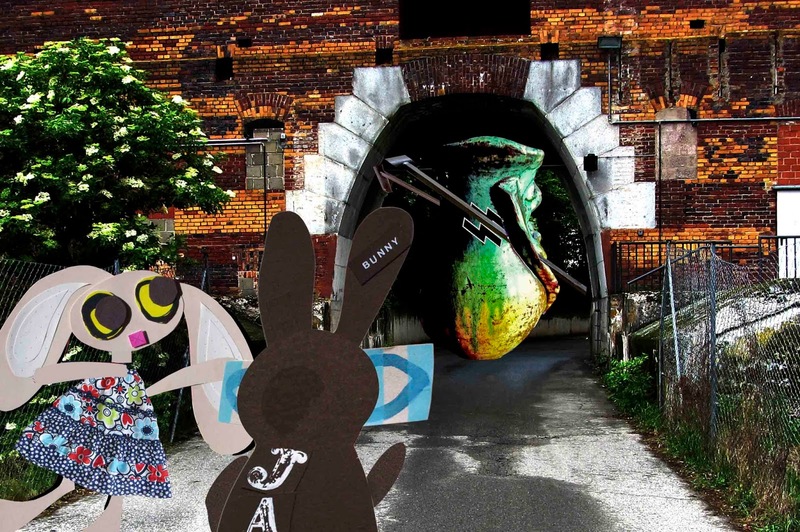 "Well I think it should lighten up," said the Wabbit. 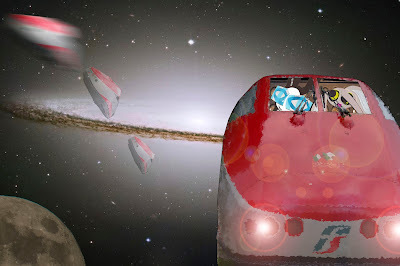 Leaving only a toasty glow and a shower of second hand heating elements, Quantum the Train shook free of the bubble, The Wabbit stared into space. Lapinette looked the other way. "There's Motor Unit One!" Everyone swivelled. "Come in Motor Unit One." signalled Quantum. "Do not enter the bubble." He tried again. "This is an all galaxy health and safety emergency. Stay away from the bubble." No communication reached him. 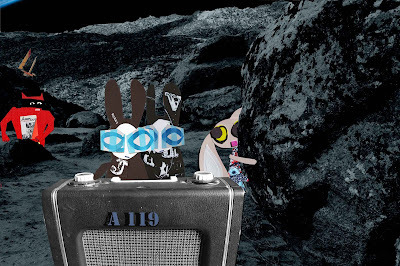 He blew his klaxon as a last resort and saw the other Wabbit briefly glance up - but Motor Unit One continued until it disappeared deep in the folds of the spin foam oasis. "He's well delayed now," said the Wabbit through his teeth. Quantum spat out an emergency beacon. They watched it whirl and flash five times before it exploded. "The Fifth Force," growled Wabsworth. "We can't abandon Motor Unit One," said Lapinette. "Nor our other selves," purred Skratch. Wabsworth shrugged. "Don't worry. Motor Unit One will do exactly the same as we did." 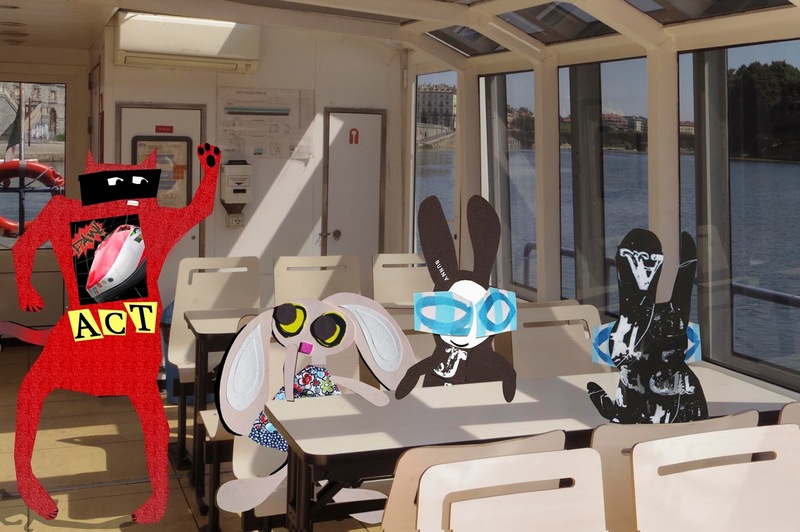 "In theory, we'll all be along very shortly," smiled the Wabbit. "We'll be beside ourselves," meaowed Skratch frantically. "We'll occupy the same place at the same time or my name's not Schrödinger." "Skratch, your name isn't Schrödinger," said Lapinette. Skratch hissed and shook his head. "I was thinking of changing it ..."
In the dining car it was numbingly cold. 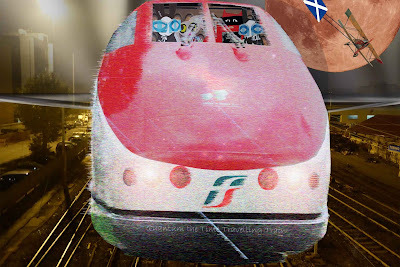 The carriage groaned with the weight of ice and so did the Wabbit. "I'm supposed to save Earth and now I'm late." "Better than too late," snapped Lapinette. Skratch the Cat loped off to assess supplies. "How are things?" inquired the Wabbit. A long and mournful meaow travelled the length of the carriage and back. "There's plenty of Irn Bru. Also a half eaten salad sandwich." Lapinette shivered and made a face. "Is there anything stronger to drink?" Skratch grunted. "An old bottle of cream sherry punch that nobody ever opened." 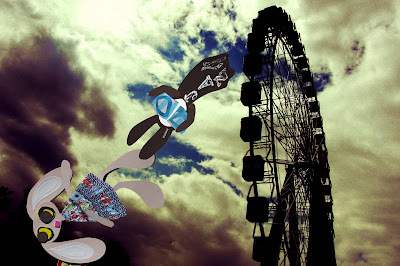 The Wabbit wondered what a mixture of sherry and Irn Bru might taste like. He shook his head. "Save it in case we have visitors." "Do we expect visitors?" frowned Lapinette. Quantum's PA system crackled. "I diverted lattice drive to power the heating, but we're running out of celery crystals." "Skratch!" called the Wabbit. "In Engine Room One there's an old wood stove I got in a market. See if you can get it going." "What do I use for fuel?" asked Skratch. "Anything you can find," shivered Lapinette. The dining car shuddered as ice tore at metal and glass. 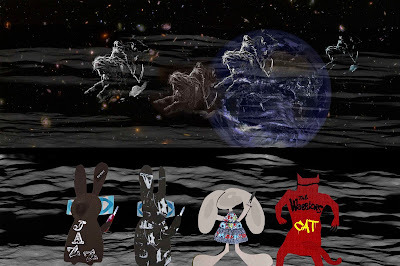 The Wabbit had an idea. 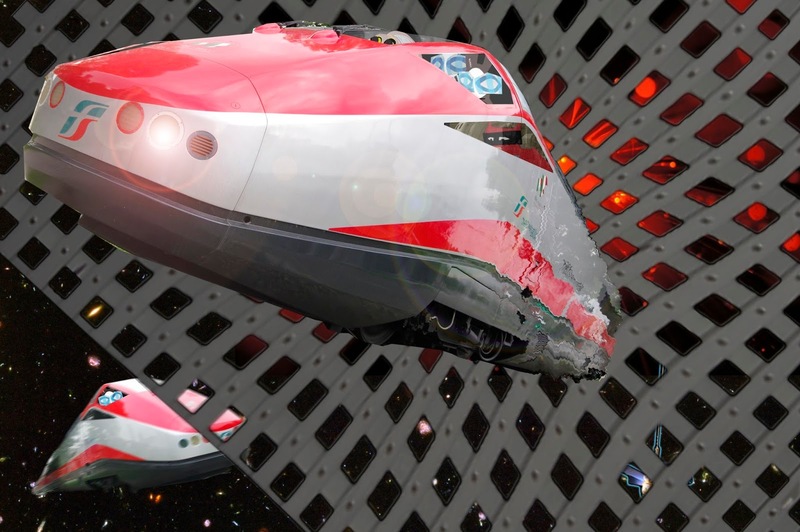 "Quantum's old motor unit is still mothballed in Engine Room Two." "I'm on it Commander," said Quantum. This time, noise and vibration was welcome. Quantum's wheels started to turn. A welcome dusty heat issued from vents. 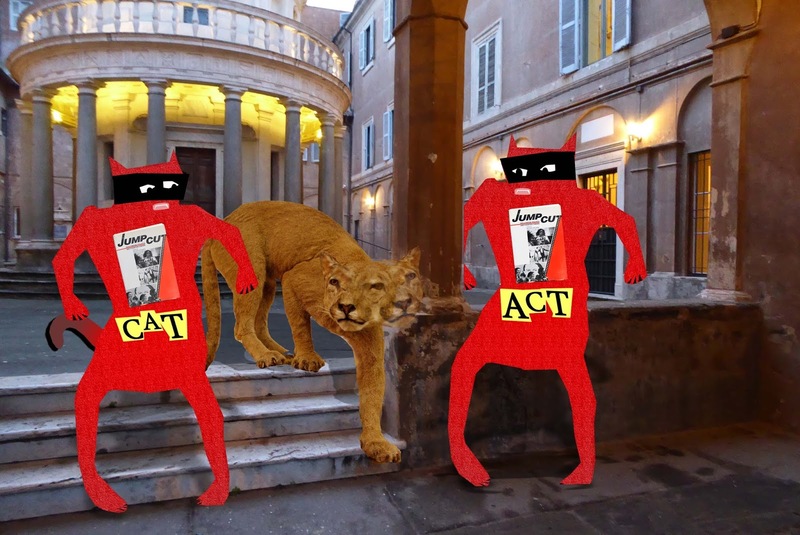 Skratch made a sudden meaow and they all looked round. "I found a crate of prosecco!" Susan pretended to crash land and they all made their way across the rocky surface. "Wow, look at these boulders," said Lapinette. "Just like Stonehedge," winked the Wabbit. "Up ahead, Wabbit," called Skratch from a nearby rock. They rounded the remains of a large meteoroid and there it was - a basic looking device, with knobs and numbers. "It looks early, Commander," said Wabsworth. "I'm uncertain of its stability." The Wabbit stretched out a paw and probed a knurled knob. The device burst into song. "I'm being followed by you moon shadows," it warbled. The Wabbit nudged Wabsworth and grinned. "There's your date. It's 1971." "Moon shadows, moon shadows," trilled the device. "Can you please shut it off!" yelled Lapinette. But the device kept singing. "It's a droid," sighed Wabsworth. He bent close and whispered urgently. "Command Line 76. Execute Bootstrap. Information Protocol 119." "Hello," said the device. A light blinked. Then a series of lights. Then a buzzer. "Connected," said the device. 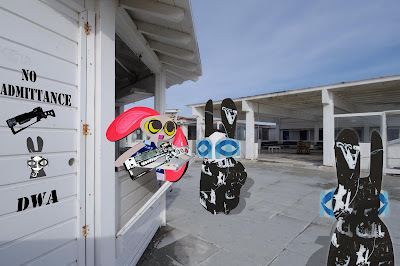 The Wabbit speculated on the connections, but he knew the answer before the device spoke again. "This is Unit 1, Hello. Hello Unit 2, Hello. Hello Unit 3, Hello." 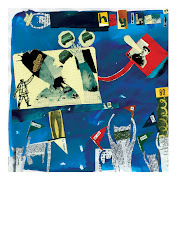 Wabsworth suddenly grabbed the device and hoisted it onto his shoulder. "Cut the courtesy calls and take me to the others," he growled. 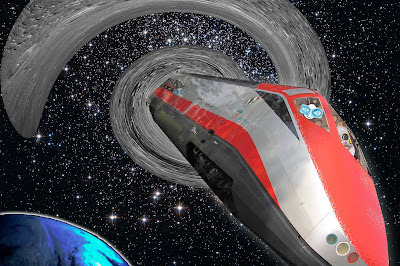 Quantum hung in space while the Wabbit shrugged his shoulders round and round. He regretted Engine Room One was less than comfortable and made a mental note to design in two armchairs, a couch and a colourful rug. He was responsible for developing Quantum's Lattice Drive, which technically speaking wasn't quite ready. He had got it thus far by raiding junk yards and the many dumpsters to the rear of the European Space Agency. Then, working alone at night in his shed, a Fibonacci super-lattice had followed, initially fashioned in curly carrots and celery, and later constructed from neutron star leftovers. 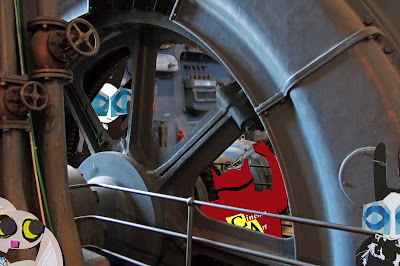 The Wabbit heard metallic sounds and poked his head round a boiler. Skratch the Cat was measuring something and muttering about problems with Brown Boveri circuit breakers. 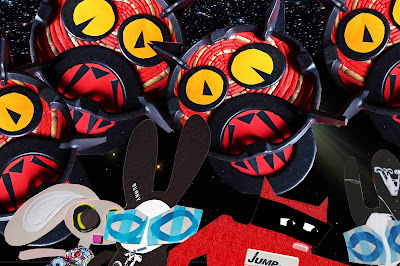 "Skratch" yelled the Wabbit at the top of his voice. Skratch didn't as much as look up. Instead he inserted two small springs and checked tolerances. "This is a 1987 unit, Wabbit. They don't last forever." "What the binky are you doing here?" screamed the Wabbit. "It's hush hush," meaowed Skratch. 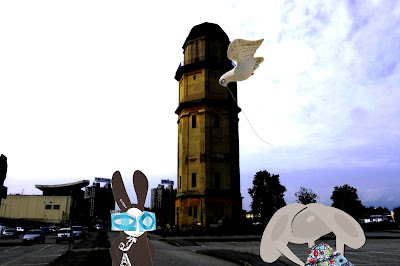 The Wabbit sighed. "At least we have the same information source." Skratch continued measuring. 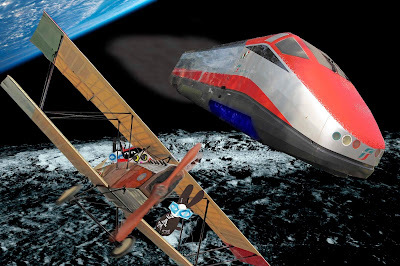 "Skratch, you're a stowaway," said the Wabbit. "Nah," said Skratch. "I'm a supernumerary." The Wabbit hid a grin. "Union card check!" The order had come straight from the Department of Danger and couldn't be ignored - so on a night lit by a shadowy moon, the Wabbit crept stealthily towards Quantum the Time Travelling Train. The radio crackled. "Who goes there?" 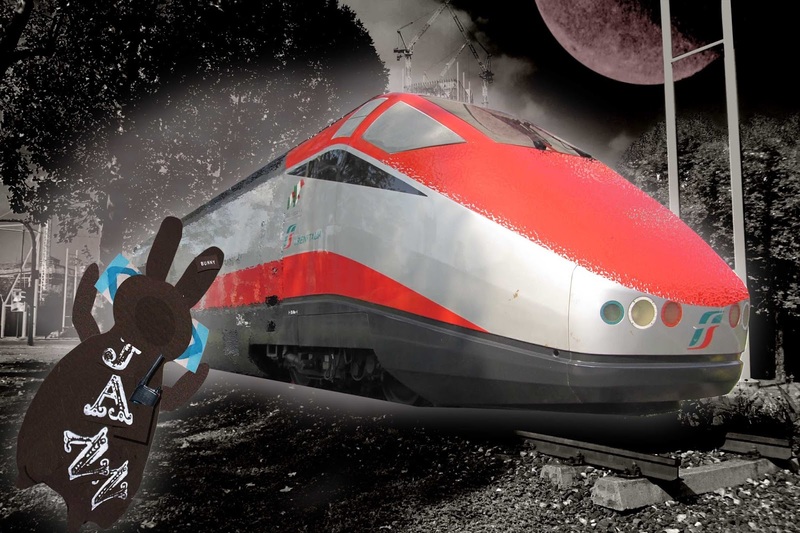 "Danger," replied the Wabbit. "What kind of Danger?" crackled the radio. 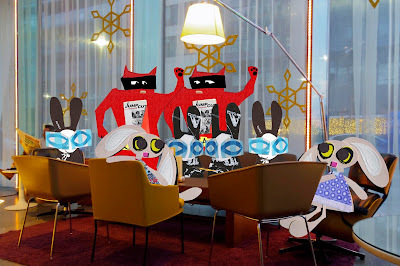 "Danger of a buying me dinner," answered the Wabbit. "Welcome Commander," said Quantum. "I'm jumping to Lattice Drive in thirty seconds. Counting." Quantum began to throb. Trees shook. Grass quivered. The shadowy moon seemed to sink lower in the night sky. 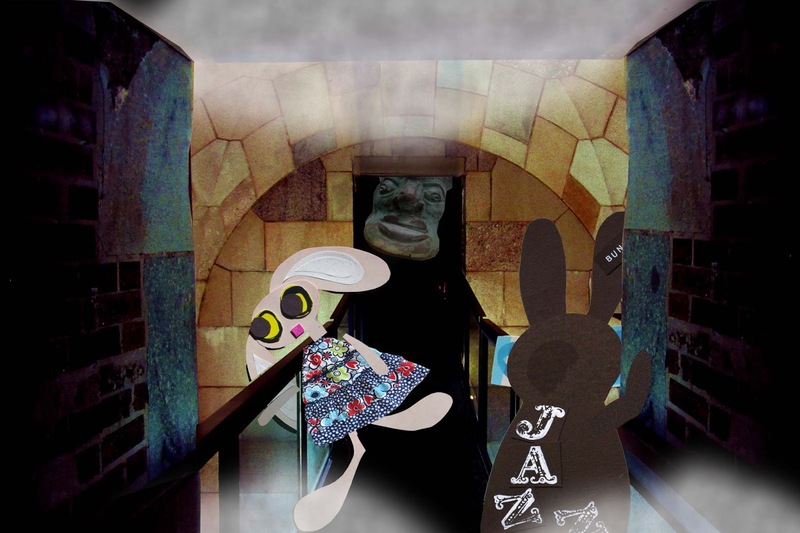 The Wabbit powered his hind legs and leaped for the door. Engine Room One was a series of blinking buttons and swinging dials. 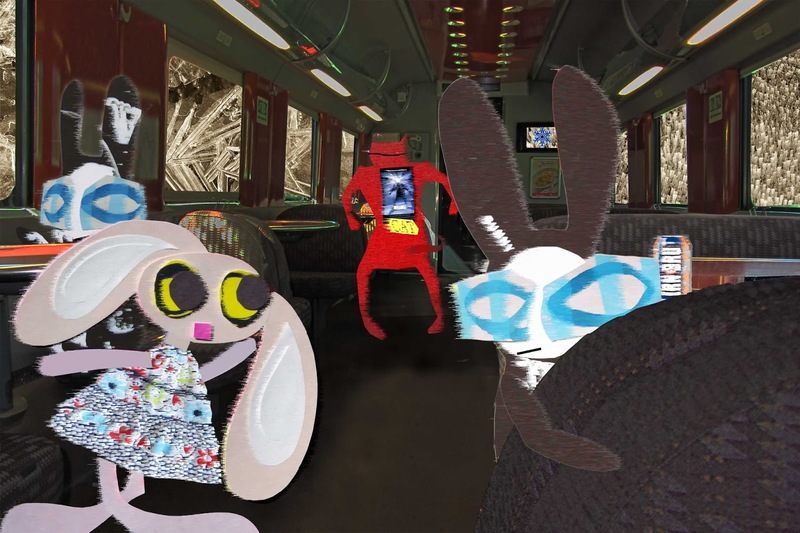 The Wabbit strapped himself in to the only seat available. "How far are we going?" he asked. "Not so very far," said Quantum. "Information?" asked the Wabbit. "Hush hush," said Quantum. 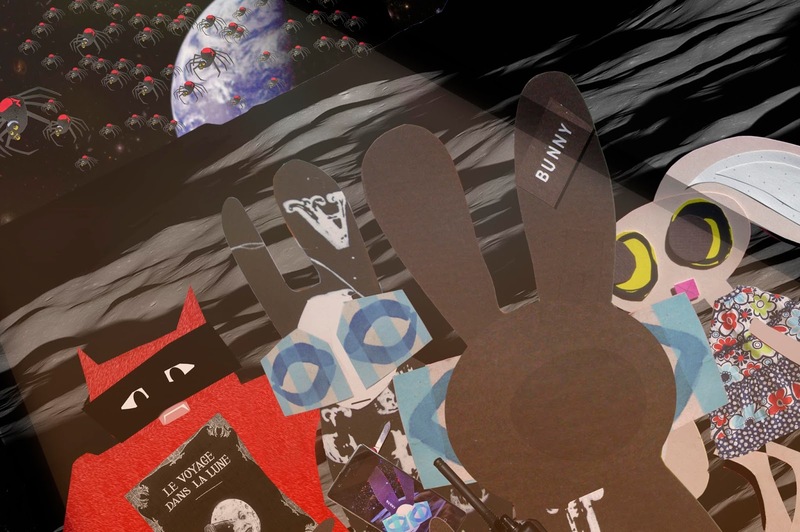 Everything vibrated, including the Wabbit. The noise became unbearable. An onlooker would have seen Quantum compress to a tiny dot and vanish. But some 32 earths away in empty space, a high speed train appeared with the Wabbit on board. He released his straps and listened to the silence. But he could hear fractured sounds of hushed conversation. "Space debris?" queried the Wabbit. "Stowaways," said Quantum. 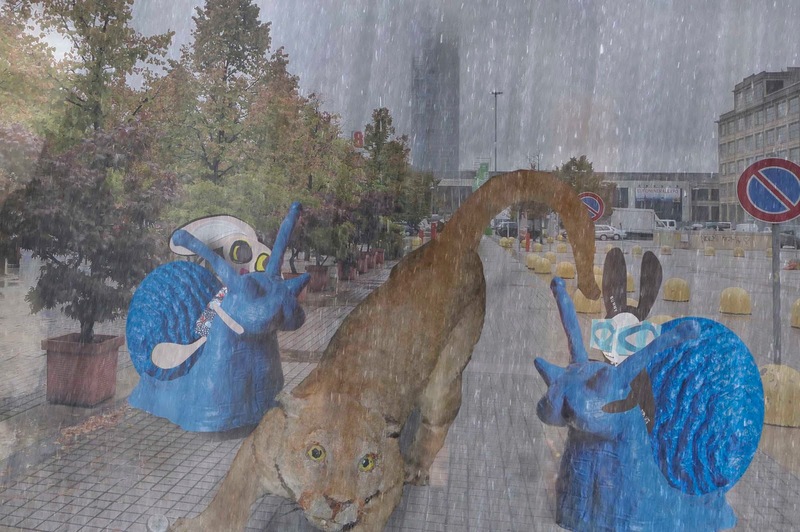 "At least there's no mice," shrugged the Wabbit. 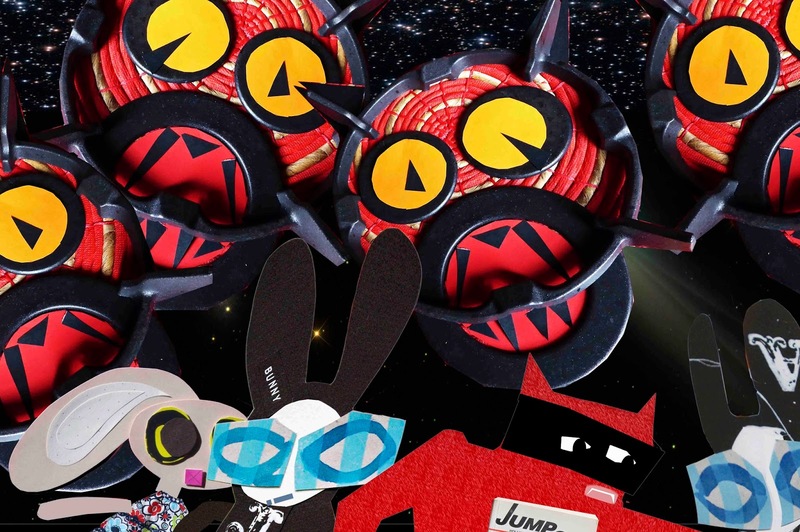 Skratch the Cat arrived and the Wabbit watched him reflected in the corner of his glasses. He pretended not to notice. "Where's Skratch with his question?" he said impishly. 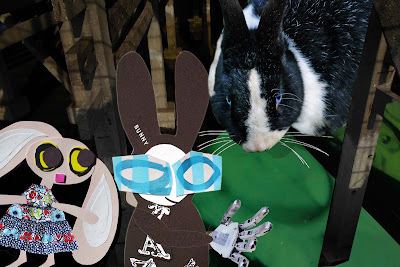 Skratch knew the Wabbit could see him and he pretended not to notice too. So he let out a sudden meow. "I have the question!" The Wabbit bent forward and whispered. "It was all a question of reflexivity." Skratch had very good hearing, but he pretended not to hear. His purr was an agreeable one. "I expect you're all wondering what sort of adventure you were in." Lapinette jumped in. "It was all a question of reflexivity!" She glanced at Wabsworth - who posed oratorically. "The adventure acknowledges the adventure-making process," he proclaimed, "subtly imagined in its deliveration." Skratch was delighted. "Elegantly put, my good lagomorph." Lapinette giggled and her ears flounced from side to side. "There's no such word as deliveration." Skratch scratched the table lightly. "In film theory, there is!" he insisted. 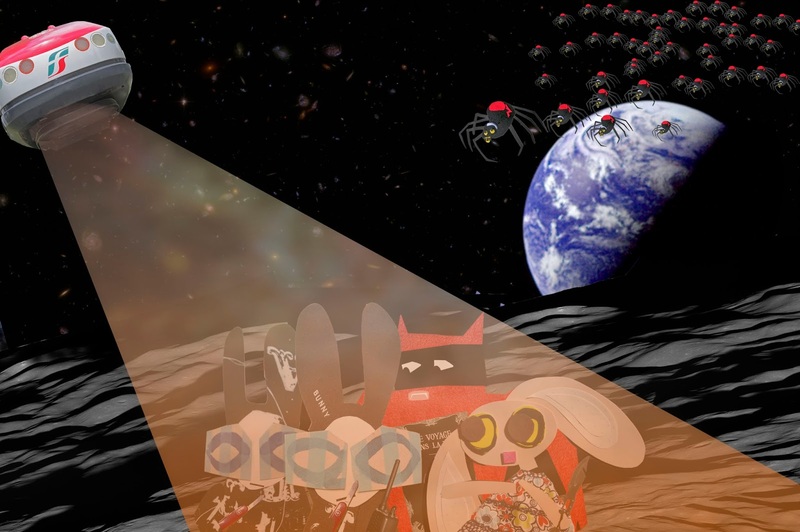 The Wabbit's tone was critical. "Is that the same as structuration?" Skratch nodded. "Not quite. Deliveration is the final endation of structuration." This kind of talk was making Lapinette thirsty. She raised a paw and a waiter appeared instantly. "Four aperitivi, please." "Immediate deliveration?" asked the waiter. "You were sleeping," said Lapinette. There was no reply. The Wabbit shifted drowsily in his seat and mumbled. "They're coming." Film credits rolled on the screen. The lights came up. The cinema gradually emptied. "Who's coming?" 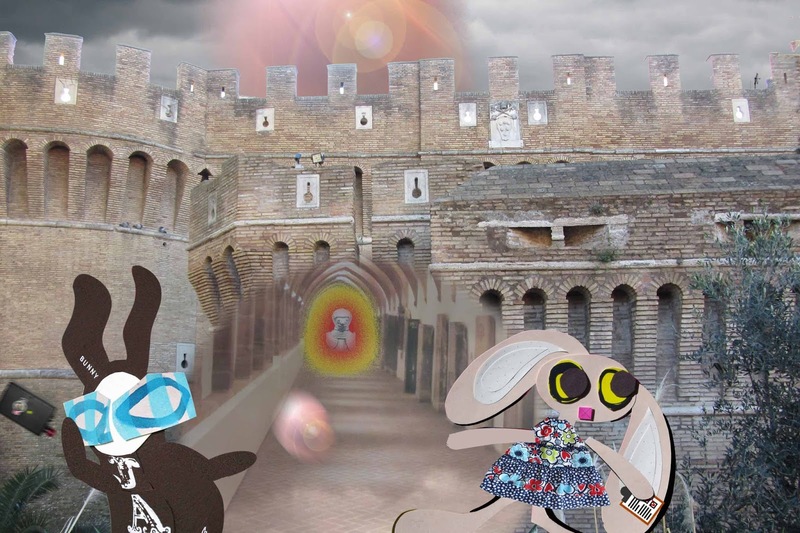 asked Lapinette finally and she dug the Wabbit in the ribs. The Wabbit jumped straight in the air. "Aaaagh! Skeletons! Run!" Lapinette sighed. 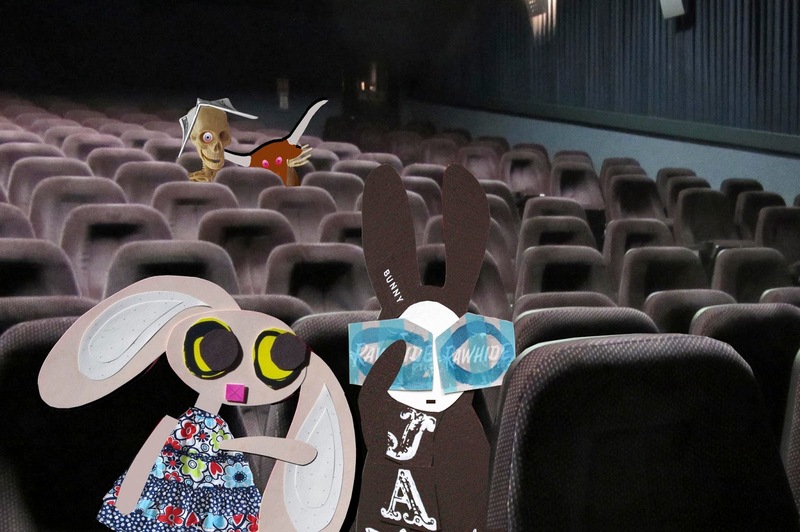 "We're at the cinema. It's Wednesday Westerns. The programme's just finished." Music filled the cinema as adverts started. "No skeletons?" 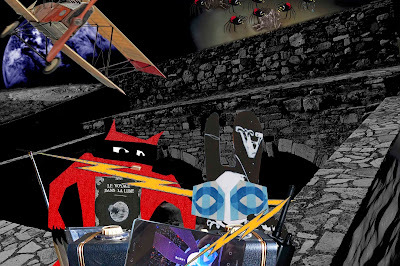 queried the Wabbit and he shook his head. Lapinette shook her head too. "No skeletrons." The Wabbit thought for a second. "Then what about the stampeding steers?" Lapinette smiled, "Not here. They were on the screen, in the film." The Wabbit glanced around uneasily. 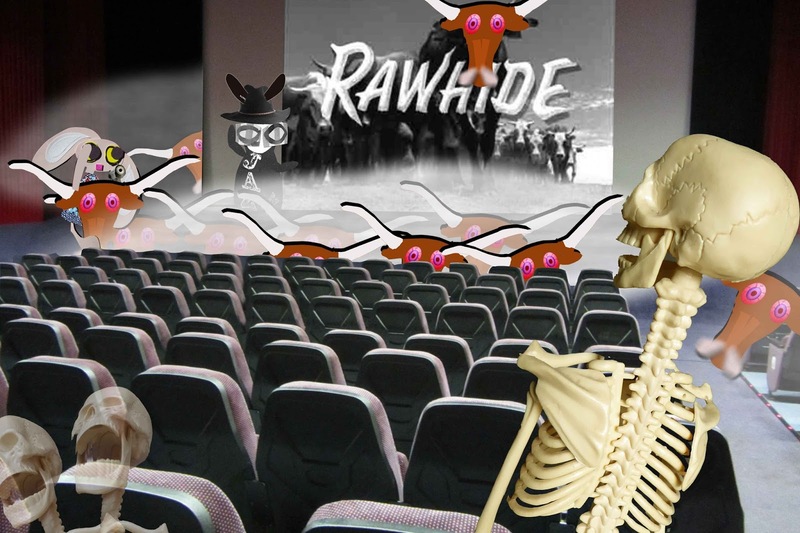 "But I saw cattle, tearing up the cinema seats." Lapinette smiled again. 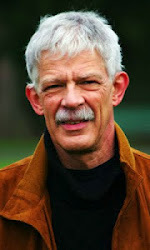 "In the movie, cattle stampeded through a town. They trampled the sheriff, then destroyed several barns and a saloon." 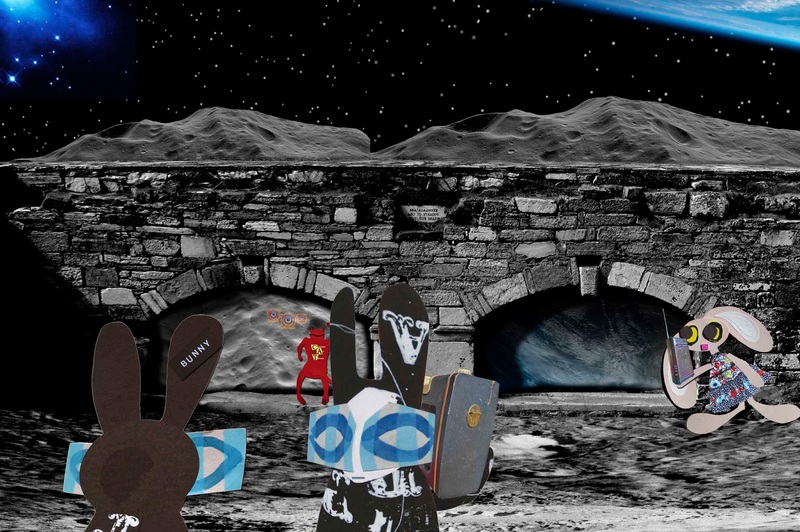 The Wabbit looked sceptical and gestured behind him. "Then can you tell me who they are." "They just came in," said Lapinette. "They're here for the Rocky Horrorthon." Now the Wabbit smiled and sang. "Let's do the Time Warp again!" "Later!" grinned Lapinette. 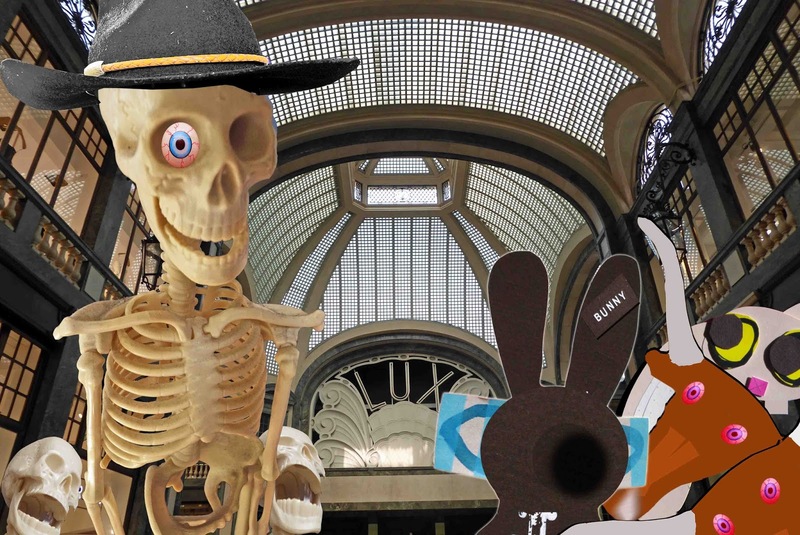 It was the very devil of a skeleton and it towered above the Wabbit with one staring eye and a sardonic sneer. "Give me back my herd." 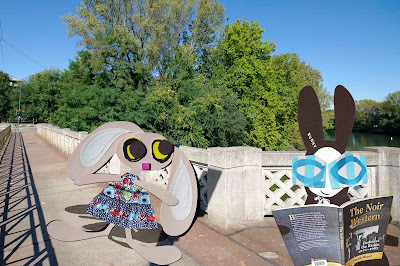 The Wabbit looked up and matched the sneer. "You give me back my hat." The steers were agitated. "We won't let him take us," said one who was bolder than the rest - but the devil skeleton rattled his bones at the Wabbit. "We met before, didn't we?" 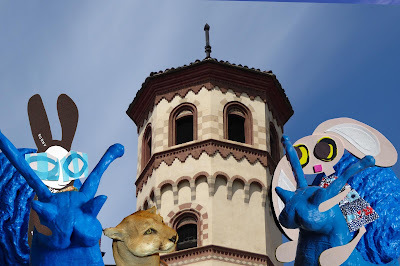 The Wabbit's teeth flashed. "That's for you to know and me to ignore." The herd stomped noisily in the background and the Wabbit whispered to the bold steer. "On my mark, the herd turns." The devil skeleton peered down. "Always the trickster, Wabbit?" He laughed - but it was the uneasy laughter of fear. "What's your signal, Wabbit?" whispered the steer. 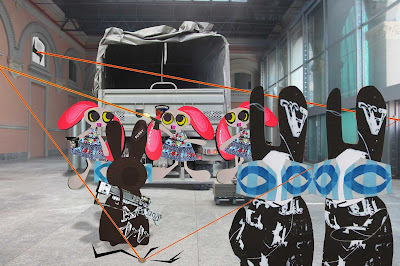 "I'll make a joke," said the Wabbit. "Oh no," thought the steer but he mooed details to the herd. "Then?" asked the steer. "Then charge the skeletons in a mighty stampede," advised the Wabbit. The steer thought carefully. "What's our motivation?" "Freedom!" yelled the Wabbit, and he held up his paws in an X. 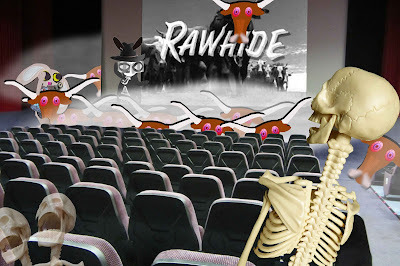 With lightning speed, the herd turned to face the skeletons. Nostrils flared and hooves beat the ground. "Freedom!" they mooed. "Liberty!" shouted Lapinette. "Liberty!" repeated the herd and they lowered their heads. Horns clashed and haunches flexed. The smell of anger hung in the air. The Wabbit looked at the devil skeleton. "In your place, I'd get out the way ..."
The Wabbit fumbled with the skeleton key and a door creaked open to a blare of sound from giant loudspeakers. "Rollin' rollin' rollin', Rollin' rollin' rollin." But there was more. The panting smell of hot breath was as loud as the music. "The Devil's Herd," gasped Lapinette. Long horns clashed like swords. 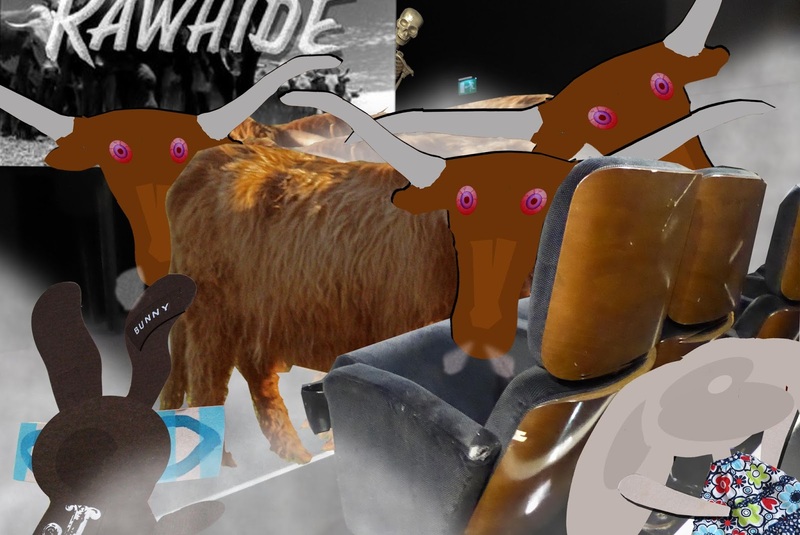 Hooves beat a chant on the cinema floor. 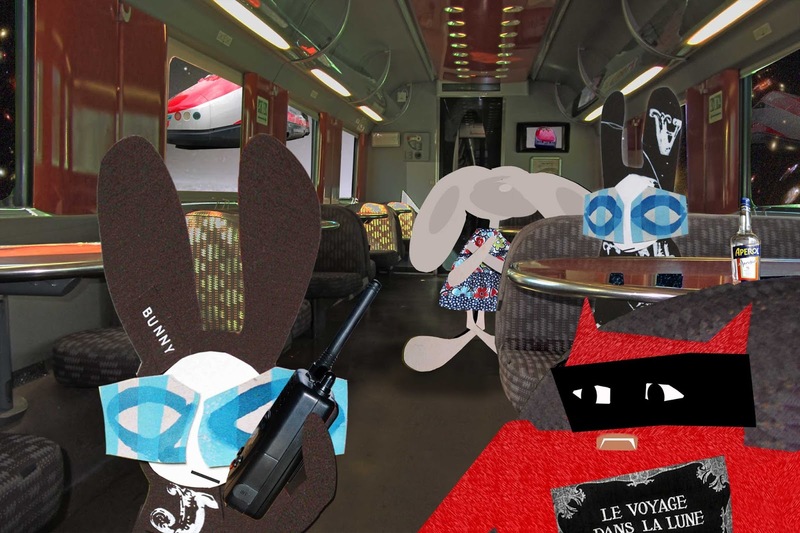 A steer looked at the Wabbit square on and his nose pumped fiery breath across the seats. And then it spoke in a low moo. "Is this Cinema Twelve? We're booked for The Devil's Doorway." A frantic bellowing followed as cattle shuffled in anticipation. 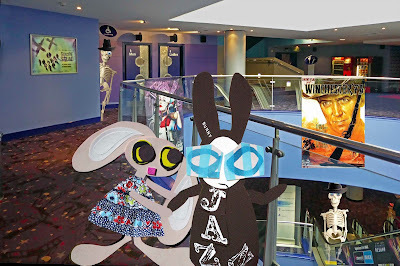 But the Wabbit had simply no idea what cinema they were in. "Perhaps it's a trailer or a short," he suggested. Then he had a thought. "Why don't you take your seats while I nip down to the foyer and get you tasty treats?" The Devil's herd swished their tails as they milled around. Not without some difficulty, they sat down and mooed to each other about movies. "I'd rather see Duel in the Sun," said a steer. "Oh I know," said another, "we always get stereotyped. We're constantly typed as stampeding." But another steer, more aware than the rest, noticed a skeleton lurking behind the screen. 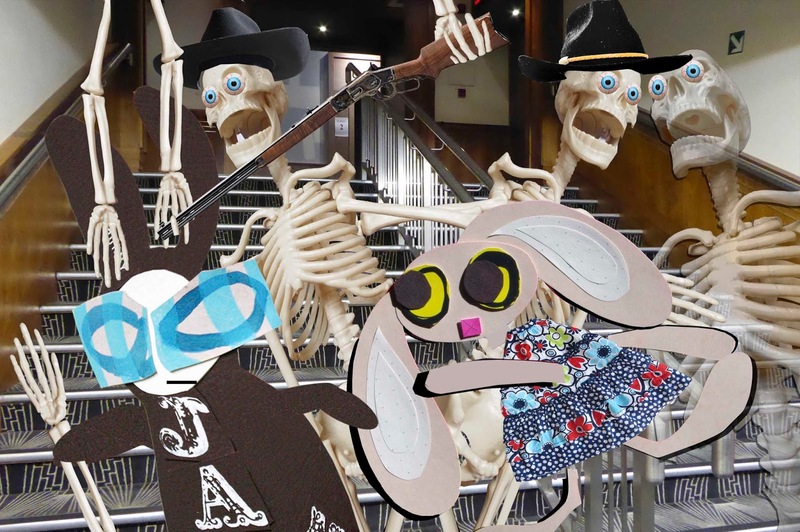 "These Bone Riders are a menace," he said to the Wabbit, "they're after our hides." The Wabbit laughed. "Well bless your beautiful hides," he said. Then he smiled and murmured, "These bags of bones are on a hiding to nothing." The Wabbit suggested taking the cinema stairs but suddenly they were behind them. There were dozens of skeletons and they kept coming. They moaned, they groaned they rattled - and worse than that, they sang. "Skeletrons!" yelled Lapinette. The Wabbit knew Lapinette pronounced skeletons that way and never had the heart to tell her. A bullet from a Winchester span past the Wabbit's ears and ricocheted from the wall. "Hate" shouted one skeleton, "Murder," shouted another. But the last skeleton grasped at the Wabbit's paw and shouted "Revenge!" The Wabbit fur stood on end. He made for a corridor that led behind the screens and he pulled Lapinette along with him. Two skeletons put their skulls together and warbled. "Oh where's the devil's herd? Who took the devil's herd? We'll ride across the burning sky 'til we find the devil's herd." The sound of snorting steers issued from their ghastly mouths and their hot breath coursed down the stairway. 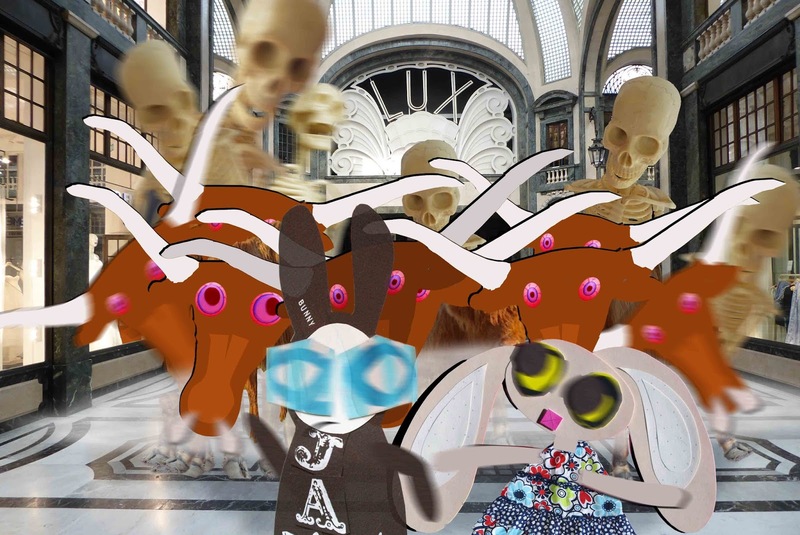 Their bones rattled as all the while as they chased the Wabbit and Lapinette as they stampeded through turning after turning. "Get the rustlers!" shouted a skeleton. "We're gonna cook you over a campfire," shouted another. "With beans," shouted a third. "Skeletrons can't cook," yelled Lapinette over her shoulder. 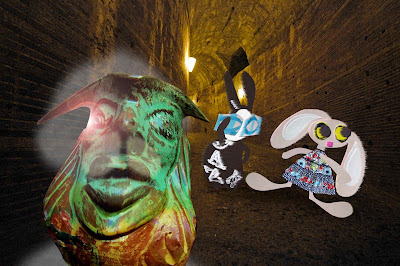 The Wabbit looked for a door and rummaged in his fur. "What are you looking for," yelled Lapinette. 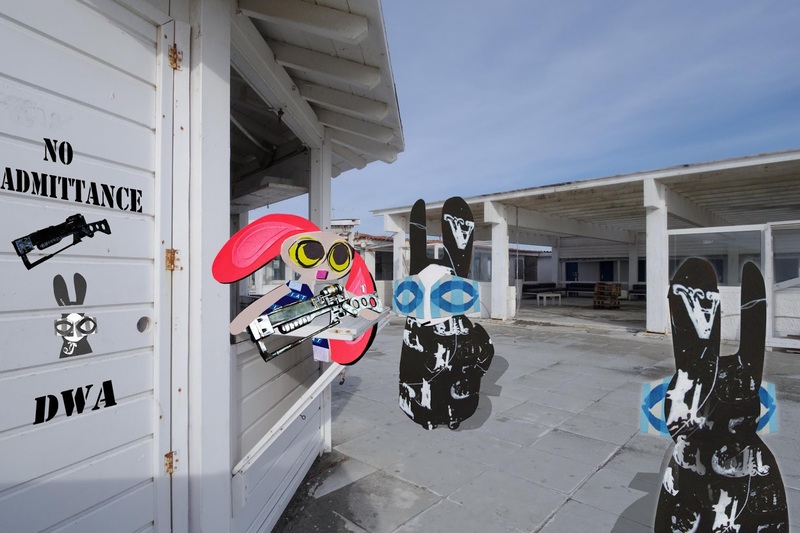 "Skeleton key," shouted the Wabbit. The Adventure Caffè was in the Safe House and it was the cosiest place to be. The medieval castle provided all that they needed, wine, ale and a slap up meal. "Where's Puma going?" asked Lapinette. "He made off with half the food," scowled Wabsworth. Skratch just laughed. "Don't worry I know where he hides it." Lapinette raised an inquiring ear. "In the kitchens under the vegetables," explained Skratch, "it's a cat thing." Lapinette tugged at the Wabbit's paw. "What about the question?" 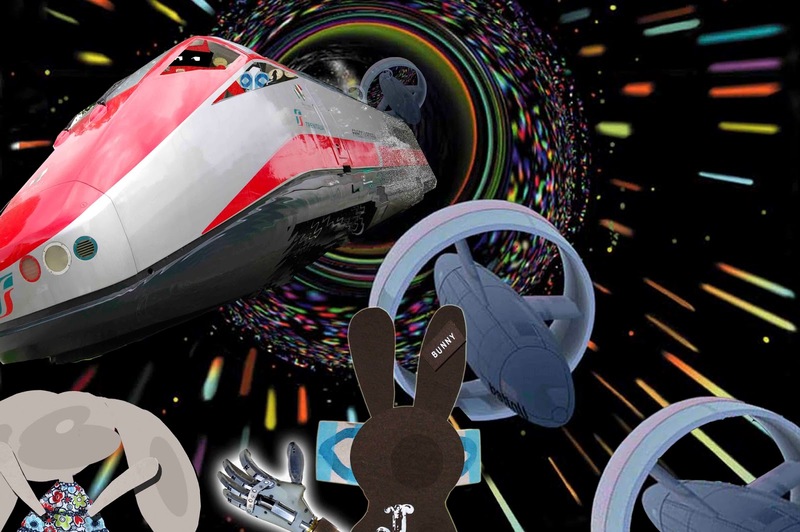 "OK," shrugged the Wabbit, "what was that for a kind of adventure?" Skratch raised his paw high. "It was a multilevel discourse." "Umberto Eco," said Lapinette. "Yes," nodded Skratch, "but your adventure had a specific modality, resting firmly on colour saturation." "Did it?" smiled the Wabbit, winking at Lapinette. "It did," said Skratch. "In turn, the colours connoted environmental concerns." "I need another drink," said Wabsworth. "What colour would you like it?" smiled the Wabbit. "I like my wine crystal clear," said Lapinette. "My ale should be deep straw gold," said Wabsworth. Skratch chuckled. "I like to drink a robust stout. Then I can pretend it's doing me good." There was a sudden shaking. Plates rattled. 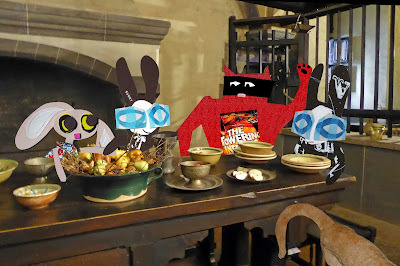 Golden nectar quivered in the Wabbit's tankard, The castle filled with medieval clanking. Lapinette frowned "What was that?" "Just a little tremor," said Wabsworth. The Wabbit looked at waves of beer lapping the inside of the tankard and murmured. "We were shaken but not stirred." The Golem stuck his fracking tools in the lake. But the Wabbit and Lapinette were pretty quick, even by rabbit standards. The Wabbit swam to a small island and from somewhere, Lapinette acquired a police barge and chugged straight at the Golem. "You rabbits are nothing but trouble!" yelled the Golem. The water clouded with fracking fluid and the stench was considerable. Lapinette grimaced and shouted from the bow. "Where's your chicken licence?" The Golem was bamboozled. "What chickens?" The Wabbit threw his voice and the clucking of 100 chickens swirled from nearby trees. "The chickens said they would help me," groaned the Golem. 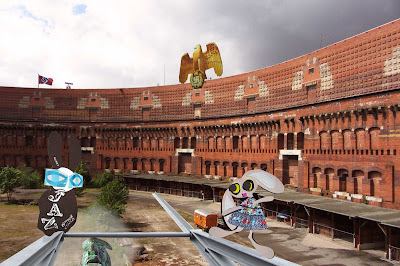 "The employment of chickens is forbidden under City Ordnance," stated the Wabbit. "They're not my chickens," screamed the Golem. "Ah!" said Lapinette strictly. "Chicken theft is by massive fines punishable." Her barge grew closer. 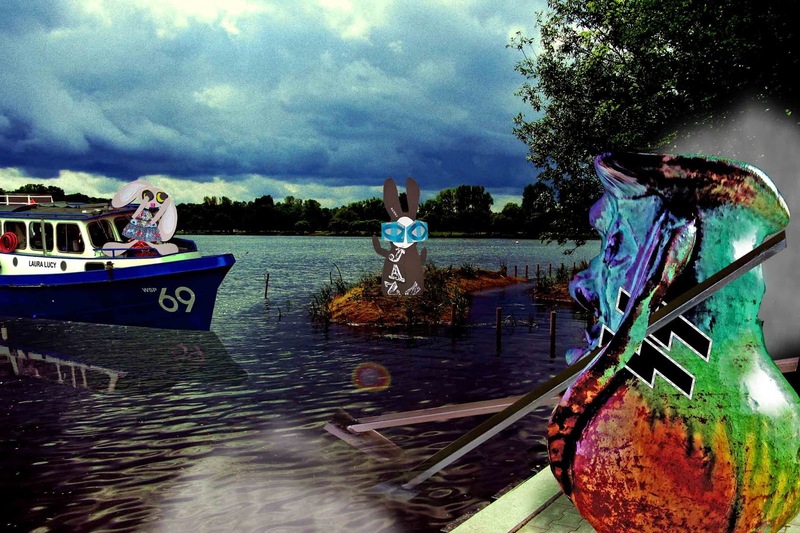 The Wabbit fished in his fur and dropped something in the water. A bolt of electricity surged towards the Golem. Water boiled for an instant. Tools burned red. The Golem yelled in pain, dropped his tools, clutched his sides and froze. 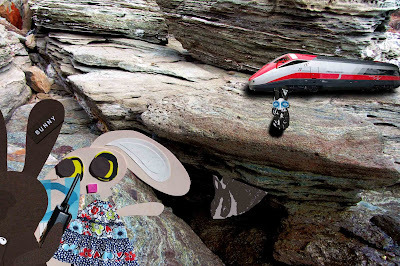 The Wabbit smiled grimly because now the Golem was completely inert. But from the depth of the waters rumbled a voice - the voice of the Fracker. "I'll be back to frack!" Their leap was overstated and they overshot the Golem by a long way. But they were fortunate. A massive Ferris wheel lay directly in their path and it was spinning at speed. "Sling shot!" yelled the Wabbit. Lapinette reached the Ferris wheel first. She bounced on the top gondola and with a thrust of her feet, launched back to the Fracking site. Only now, she was going twice as fast as before. The wind tore at her fur and the ground loomed sharply ahead. 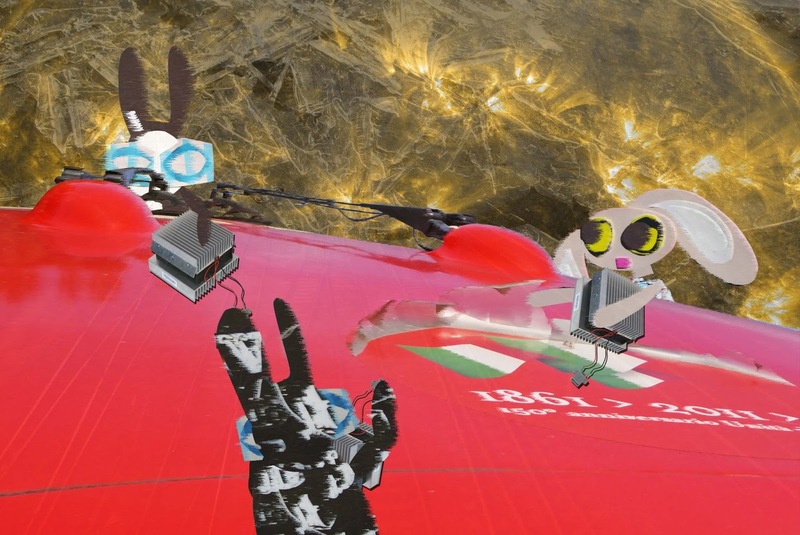 The Wabbit landed awkwardly inside a gondola but it propelled him outwards leaving some of his fur on the metalwork. He looped up and then down at an alarming rate. Now he was directly behind Lapinette and he saw her legs move position - so he did exactly the same. "Ouch," he groaned. Lapinette yelled that he needed more exercise. The Wabbit could hardly hear what she said but he knew anyway. It occurred to him that he was getting quite enough exercise as it was. He watched Lapinette's legs draw into an arabesque position. As she landed, she executed a perfect chassé and stopped as elegantly as an airliner. 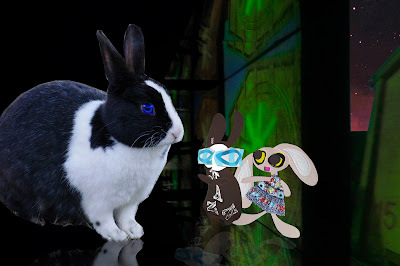 The Wabbit made a fair attempt to copy her then gave up. He somersaulted along the bumpy road and came to an abrupt halt. Lapinette turned to look at him. "How was it?" she smiled. "Perfect," said the Wabbit. Puma walked for several days. They followed until he came to a clearing where a castle rose from the mist, lit by a bleached sun. "Chemicals," growled Puma. Lapinette wrinkled her nose. "It stinks like a soggy old mop in a corner." "Oh stinky stench," sneered Mo. "Poo bum smell," drawled To. The Wabbit waved up at the tower, but no-one responded. "How do we get in?" murmured Lapinette. "There is no door," said Puma. "Then how do people inside get out?" asked Lapinette. Puma screeched softly. "No-one has ever seen anyone." The Wabbit ran his paw across To's antennae. "Well, I don't like the sound of them." The team rode around the castle but although they looked from every angle, the scene was exactly the same. "There's a sort of a village nearby," snorted Puma. "Who's there?" asked the Wabbit. "Vagabonds, jailbirds, swindlers, mountebanks, organ grinders and lazzaroni," said Puma. "Cool," breathed Mo and To. Lapinette thought for a while. "Does this unpleasant assembly know who's in the castle?" "No they don't," said Puma, "but they hold them in the highest regard." The Wabbit contemplated kicking the walls, then felt in his fur for his emergency supply of CL-20. Lapinette looked stern. "Wabbit, is that entirely wise?" 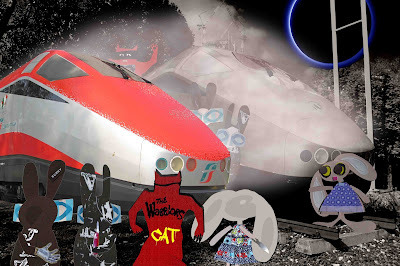 The Wabbit shrugged. "Cut out the middle rabbit?"